Hi! I made this a bunch of days ago, but then I went away with my sister for the weekend and then worked and some other things happened. Now I have a day off and despite how nice and sunny it looks outside, it's still winter. It snowed yesterday. Hmph. 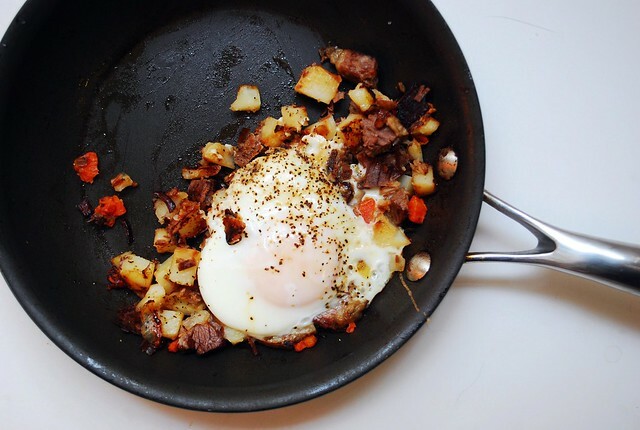 Anyway, this is one of my favorite breakfasts, and there is nothing more sad than eating all your corned beef at night and then waking up in the morning and realizing it's gone and you can't make hash. Boo. It's easy and fast and good and you can even add in some spinach to make it healthier. If you want to do that, spread a few handfuls of spinach over the hash right before you add the eggs, then when it's wilted, stir it in and add the eggs. We did this for dinner last night. Cube up your meat and potatoes and vegetables into little pieces. Heat up a pan with about a tablespoon of olive oil or butter, and toss in the cubed things. Press down with the back of a spatula, and cook without stirring about ten minutes over medium heat, until brown and crusty. Flip over the best you can, pat down again, and cook another few minutes. Crack an egg or two or three on the top and lower the heat, and cover. Cook until the whites are set and the yellow is still runny. Serve immediately. 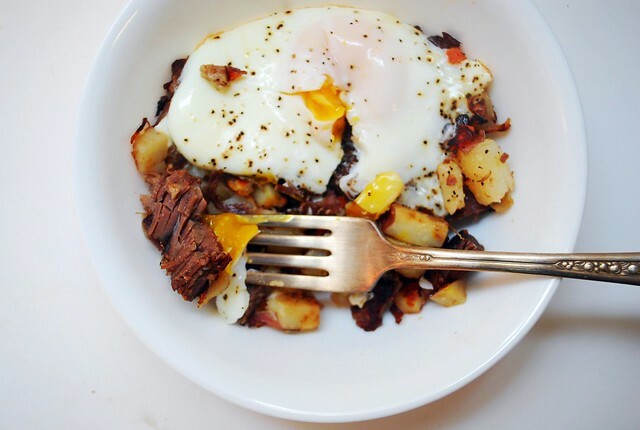 There are a lot of dishes you can create from leftover meals. Eggs!! My favorite food to take a good breakfast, I want two eggs , a piece of bread , jam and orange juice ! Very nice recipe but eating left over food sometime lead to a Bad health condition!